Increasing search visibility through ASO is more than just finding the right keywords, placing them strategically, and hoping for the best. It’s an ongoing process that requires constant tracking, modifications and making sense of big amounts of keyword data. But how can you determine whether the modifications you’ve made had an overall positive impact? At yellowHEAD, we track lists of hundreds of keywords for each of our partners’ apps. Most of these keywords change in rankings constantly and, obviously, some keywords are more important to track than others. While we always see significant increase in ranking for the bulk of keywords, the minority of the keywords might see a decrease. This gets even more complicated, as while an app gets ranked for the keywords targeted in its store listings, it also gets ranked for many combinations of different phrases and individual keywords. It’s crucial to understand how to make sense of these huge amounts of rankings data and create simple indices that show ranking progress. At the end of the day, we want to see if the ASO changes have increased search visibility. To track your app’s keyword rankings at any given time, you will need to use a software tool that scans the app stores and accumulates relevant keyword data. Some of the more popular tools in the industry that do so are: SensorTower, Appannie and MobileAction. In this post, we’ll look at the important data generated by these ASO tools. Choose different dates to benchmark keyword rankings over time. As mentioned, keyword rankings change on a daily/weekly basis. To understand the impact of new ASO listings, we want to measure change over time for our top targeted keywords, meaning – how rankings for each keyword changed before ASO changes were uploaded to the app store and after. Top keywords are mainly determined by traffic. The way traffic is measured changes depending on the ASO tool you’re using (SensorTower, Appannie, MobileAction…). In ST, it’s a score between 1 to 10 on an exponential scale. 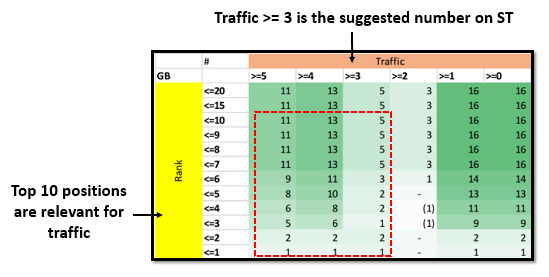 A traffic score of over 3.0 is considered medium to medium-high and should be tracked. In iOS US the scale is a bit different and any traffic that is larger than 2.0 is worth tracking. The other factor should be keyword relevance – how likely someone who searched for this keyword is to be interested in your app. Below is an example of a selection of high-traffic and relevant keywords being tracked for a messaging app. Notice that the “Dec” column is conditionally formatted to highlight improvements/declines in keyword rankings since the previous month. Normally, an app gets most of its organic traffic (that isn’t brand-based) in the app store from keywords that have a good amount of traffic (over 3 in ST) and that the app ranks well for (top positions). According to these two factors, you can create your keyword index for each country. The index is a bulk of keywords that shows us change over time. Using the keyword data in Figure 1, we can create a summary of the keyword rankings by country. 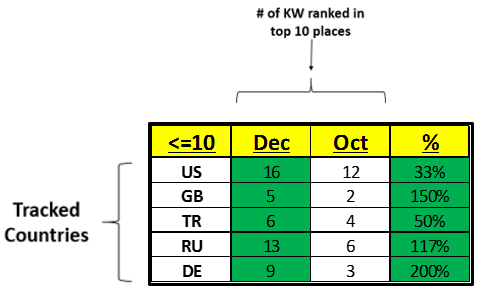 What we usually use for an index is the number of KWs with Traffic >= 3 and position <= 10, in each relevant country. 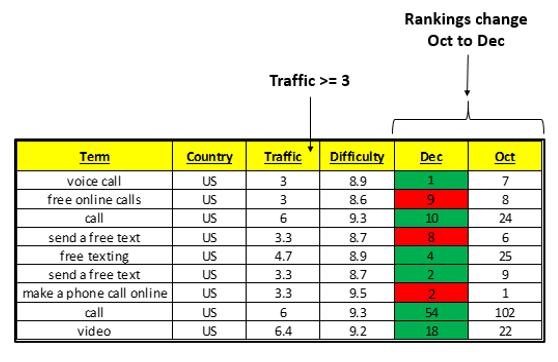 We want to make sure the app is now ranked for more keywords in top 10 positions with traffic over 3. Set up the formulas in your spreadsheet so you can change the traffic or position stats to be more aggressive or conservative. The keyword ranking changes indicated by this index may affect page views and eventually installs, but what about other keywords with a lower traffic score or rankings over 10? They most likely will not affect traffic, but might show progress for your ASO strategy. A good way to see progress across more keywords is by creating a sensitivity table. The purpose of this is to map out your overall improvement. The table allows you to see change in different bulks across the entire data. The sensitivity table separates the entire keyword data into sections (according to traffic and rank), takes two dates and counts the amount of keywords in each section. Adding conditional formatting will make it easier to scan visually for results. These are some of the indices we use to make sense of big amounts of keyword data. You can definitely benefit from them or simply customize and use them as a basis to come up with your own helpful solutions.